After 3 years in the making!! 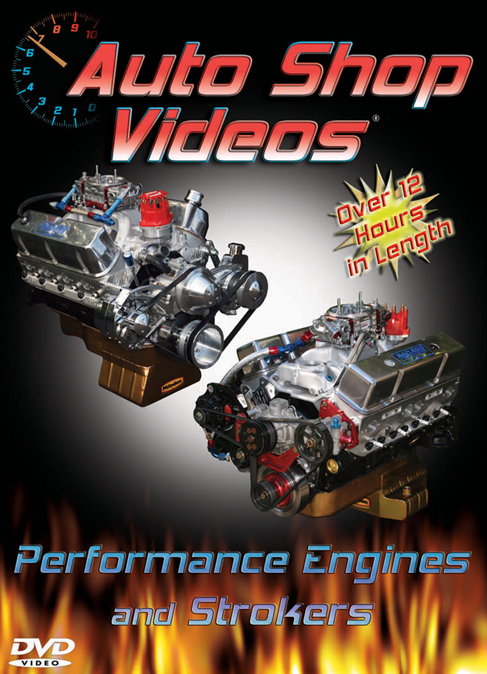 Performance Engines & Strokers is the ultimate video on how to build any kind of performance engine, including numerous types of big cubic inch strokers! This is a HUGE 6 DISC SET containing almost 13 HOURS of IMMENSE, HIGHLY DETAILED information! You'll see exactly what to do, and how to do it, for building your own high performance street or strip engine in your own garage, including how to clearance it for building a monster stroker! It is absolutely PACKED with information, techniques, tips and tricks that you can't just learn anywhere! You're taken through the entire build of a monster 600 HP 408 cubic inch small block Ford stroker, PLUS a 383 small block Chevy to show you all of the differences (and similarities) of building pretty much any kind of stroker or performance engine. You'll also see details of other engines, including the very popular 347 Ford stroker. Once you know how to build these kinds of engines, you'll know how to build ANY kind of performance street or strip engine, whether it's a big block, a small block, or a stroker of ANY size! You'll be taken through the entire build process, from the machining process, to the prep and mock-up, to the clearancing for the massive stroker crank, the assembly, and the final build. You'll be shown various components along the way with comparisons to other types and brands of components, and why we chose the particular parts for our build, from the blocks, the cranks, rods, pistons, rings, bearings, cams, lifters, heads, rockers, push rods, intake manifolds, etc. You'll see how to file-fit rings, degree a cam, set-up the valve train and geometry, check clearances, port match an intake manifold, and much, MUCH more! There simply isn't another more detailed video on building performance engines than this one! Sure, there are lots of free videos available on You Tube these days, but you have to consider the source and where that information is coming from. Is it accurate and true? What's the reputation of who's handing out that free information to back up what they're saying? With Arron's 35 years of experience in building some of the baddest, most powerful street & strip engines (and cars, trucks and boats), that have won just about every kind of race imaginable, broken records, created class champions, etc, under his belt, from road racing, drag racing, mud bogs, hill climbs, Bonneville, etc, in everything from vintage fuelers, to blown alcohol, blown gas, nitrous oxide, and everything in between, you can rest assured you're getting the absolute best, most accurate information there is, and it's worth every penny!